I was delinquent last week for Poetry Friday, but I'm back today. This week I'm going to contribute a frequent contributor's poetry (hmmm...that sounds weird!) 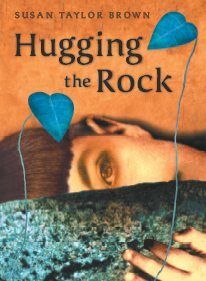 What I mean is, I'm citing from Susan Taylor Brown's absolutely fabulous and heartbreaking Middle Grade novel-in-verse, Hugging the Rock. Hugging the Rock will be out August 22. I'm not going to review it here, because my review will be in this month's The Edge of the Forest (out Monday). "We aren't able to take your call..."
"If you leave a message..."
"We'll get back to you as soon as we can." I can tell you here, not at The Edge of the Forest, that I sobbed my way through Hugging the Rock. In a good way. Susan Taylor Brown finds something from middle school that's not too embarrassing. Susan at Chicken Spaghetti recommends another poet's work for us to read. Liz at A Chair, a Fireplace and a Tea Cozy shares some Beowulf in the original (I'm a language geek and love it!) Wendy at From the Windowsill recommends a picture book in rhyme. Anne at Book Buds brings us "Empire State Building." Jen at Jen Robinson's Book Page contributes the always wonderful Langston Hughes. Little Willow quotes from a Duncan Sheik song at Slayground. More to come as the day progresses. Gregory K. has a wonderful original challenging us all to participate in the 48HBC at Gottabook. And Leila has a poet and Elmo at Bookshelves of Doom! And Michele at Scholar's Blog brings us "The Raven" and a link to an excellent resource as well.